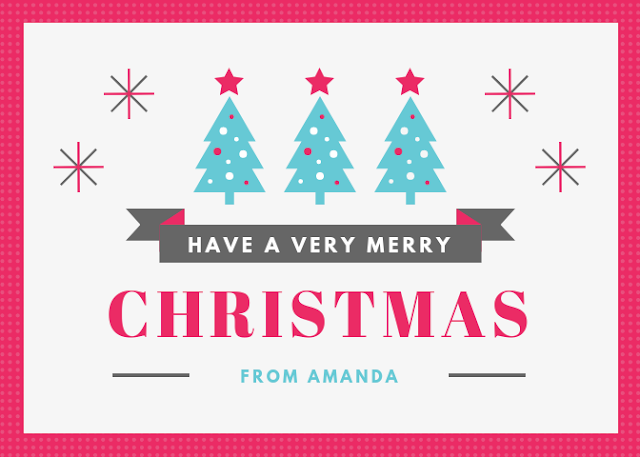 I just wanted to take a minute to wish you a very Merry Christmas and Happy Holidays! I'm spending today with loved ones and I'm reminded of how grateful and blessed I am. I am so thankful for you, too! Your support means the world to me and I hope that I have made you smile, laugh, given you a little encouragement, and a good product recommendation or two. Have a wonderful day and I'm sending lots of love and happiness! I saw this on The Skinny Confidential and I just had to share with it with you! If you haven't heard of Tim Ferriss, he is an author, entrepreneur, podcaster, and public speaker. He has written several books, including Tribe of Mentors, which is where today's questions come from. Ferriss' podcast, The Tim Ferriss Show, is also a great resource and in each episode, he deconstructs world-class performers from eclectic areas, digging deep to find the tools, tactics, and tricks that listeners can use. I can't begin to tell you just how many valuable things I have learned from his podcast alone. 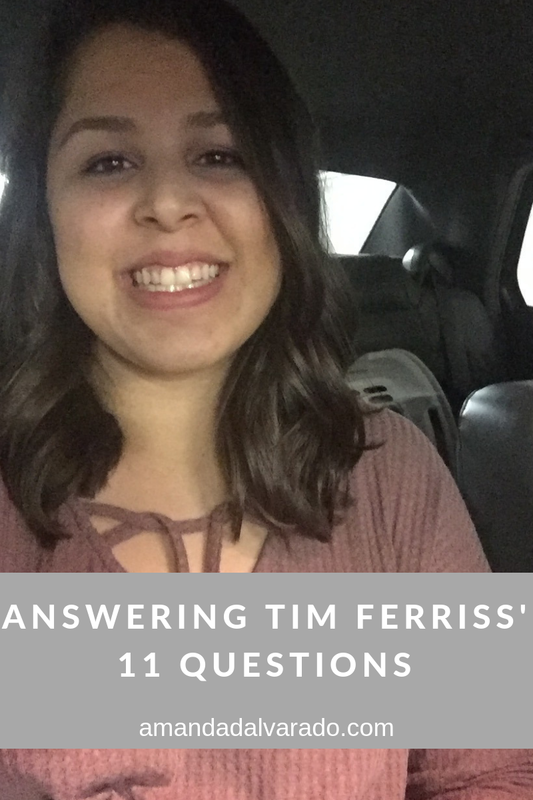 In Tribe of Mentors, Ferriss asks these 11 questions and after seeing that Lauryn Evarts of The Skinny Confidential shared her own answers, I knew that I wanted to share mine with you, too. I challenge you to answer these for yourself and share them with a friend! Also, read the freakin' book. It's a good one! 1.) What is the book (or books) you’ve given most as a gift, and why? Or what are one to three books that have greatly influenced your life? I haven't given many books as gifts just yet, so let's go with three books that have influenced my life. 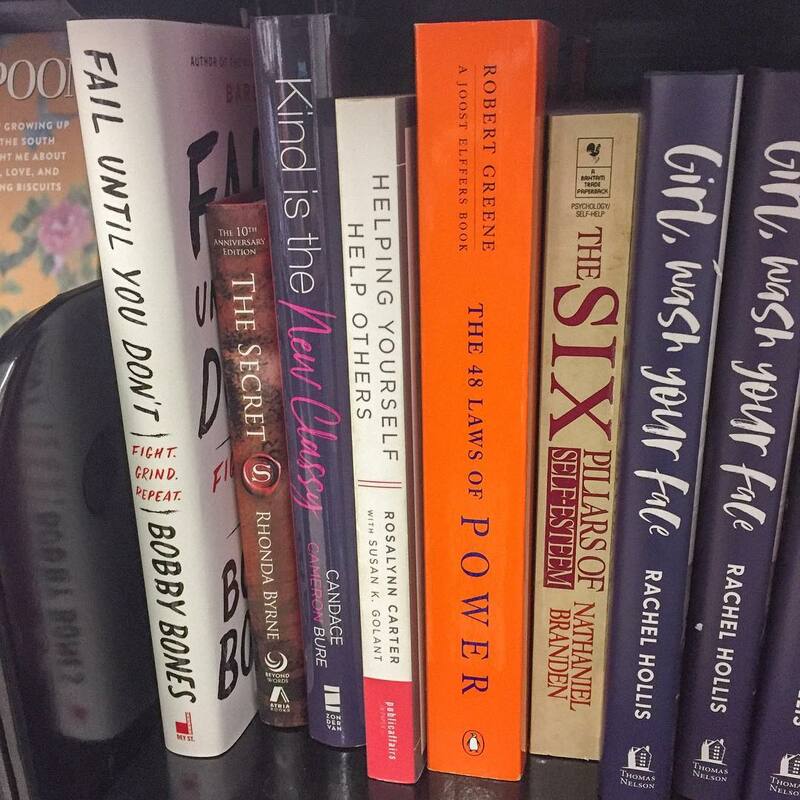 Unashamed by Christine Caine, Fail Until You Don't: Fight, Grind, Repeat by Bobby Bones, and Girl, Wash Your Face by Rachel Hollis are probably my top three at the moment. Each book tells stories of the author's lives while sharing lessons that they learned along the way to life happy, free, and successful lives. There's so many lessons in those three books. 2.) What purchase of $100 or less has most positively impacted your life in the last six months (or in recent memory)? I'm going with my Swell water bottle for this one. I am all about staying hydrated and it is one of my number one tips when people ask about health. Drink your dang water. A few other standout purchases: Essential Cleansing Solution from Demologica, this sleep mask, and this shampoo from Bumble & Bumble. 3.) How has a failure, or apparent failure, set you up for later success? Do you have a “favorite failure” of yours? My readers love specifics like brand and model, where you found it, etc. If you've been reading for the past year, then you might remember that I went to Myrtle Beach for a job interview with a news station. The position was between me and another candidate, but to be honest.. it seemed very promising. I was so excited and I really felt as though God was leading me there. As you know now, I did not get that job. I was upset, because that job was a dream and moving to Myrtle Beach was going to be this fun, new adventure. Had I gotten that job, I wouldn't be where I am today. My job today is pretty similar to the job I was up for, but I think this job is so much for fun and quite honestly, God knew that I needed to be a close to home in this season. I think I would have enjoyed that job in Myrtle Beach, but I would have also been miserable. Also, had I moved to Myrtle Beach, I probably would have never read Bobby's book (mentioned in question one!!). Do what makes your heart happy. Be kind. Love everyone. We all live different lives and nobody should feel less than for living their life a certain way. Do you! We can all be kind to each other. There is no need for hate. The biggest and most important commandment in the Bible is to love others. I think we forget that far too often. David (my boyfriend of 7 years...woah) and I recently made it a thing to have one date night every month. We see each other about once a week, but life gets in the way, money is scarce right now, and there are just other things we focus on instead of quality time together. We take turns planning a date for each month and it can be something as simple as a themed dinner and movie at home. We've made it a point to invest our time, energy, and a little money into our relationship. We're only in our twenties, but so far, this has changed our relationship for the better and I can't wait to see how regular date nights make our relationship even better in 10, 20, even 50 years down the road. 6.) What is an unusual habit or an absurd thing that you love? As you can see, I would schedule by day out by the minute. I love sticking to a schedule. I love sticking to a routine, which is great. Routines add stability to our already hectic and crazy lives, but one thing I've had to learn is that it is okay not to rigidly follow a routine. If I'm invited out for drinks with my friends and won't get home until 9, that's cool. If I'm feeling run down and need to sleep in an extra hour one day, I can do that. Balance is key. 7.) In the last five years, what new belief, behavior, or habit has most improved your life? Setting a morning routine for sure. How you start your mornings is so important for the rest of your day. I'm all about getting moving and getting hydrated when I get up. Journaling and devotions are also vital to my mornings. When you have a morning routine, you just feel more in control of your day. 8.) What advice would you give to a smart, driven college student about to enter the “real world”? What advice should they ignore? Live your life in a way that makes you happy and get rid of what doesn't serve you. Don't let anyone tell you that you have to have it all figured out at 22. Hint: you won't. 9.) What are bad recommendations you hear in your profession or area of expertise? Probably that getting a degree is the most important thing. For me, being in college was what allowed me to get internships and yes, it gave me some experience, but experience is key in this industry. Intern, shadow people, network. Get as much experience as you can and learn. You will never stop learning in this industry. 10.) In the last five years, what have you become better at saying no to (distractions, invitations, etc.)? What new realizations and/or approaches helped? Any other tips? Distractions! I am able to really focus and prioritize on what is important. Having some sort of routine really helps and I think that structure is so important. I take a walk. In college, this was easy because I lived right in Atlanta, but now that I don't live in the city anymore, that looks more like walking down my driveway or walking around the parking lot at work. Walking with some music or a podcast can do wonders. I'd love to hear your answers to one of these questions, too! Thanks so much for stopping by! Want to make this the best winter yet? I've put together a fun, winter bucket list just for you! Living in the south, it doesn't get as cold as it does in like New York or something, but it definitely gets cold. We have days where it gets below freezing, but I would say the normal temperature is probably in the 40s here in Atlanta. Even though we don't get much snow, it still feels like winter when you can get all bundled up and have to heat your car up before going to class or work. As I've said probably too many times, I really love winter. It is my favorite season and I always like to make it worthwhile. I don't want to wake up when temperatures are back in the 90s and realize that I totally just let my favorite season breeze by without taking full advantage of it! Want to make this the best winter yet? 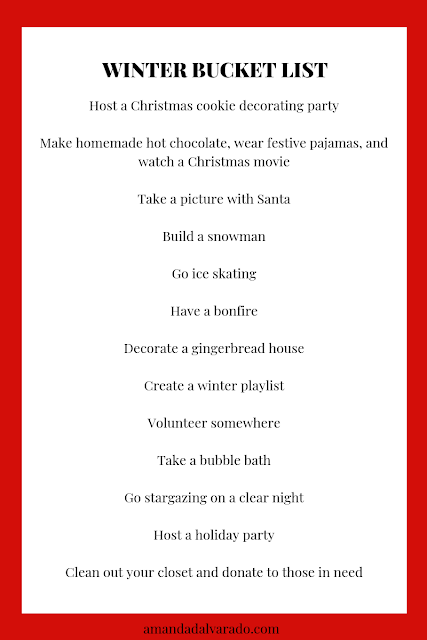 Here's my winter bucket list! Invite all your closest friends and family and ask everyone to bring a batch of cookies! Supply fun cookie-decorating essentials like icing, sprinkles, candies, even edible glitter and start decorating! 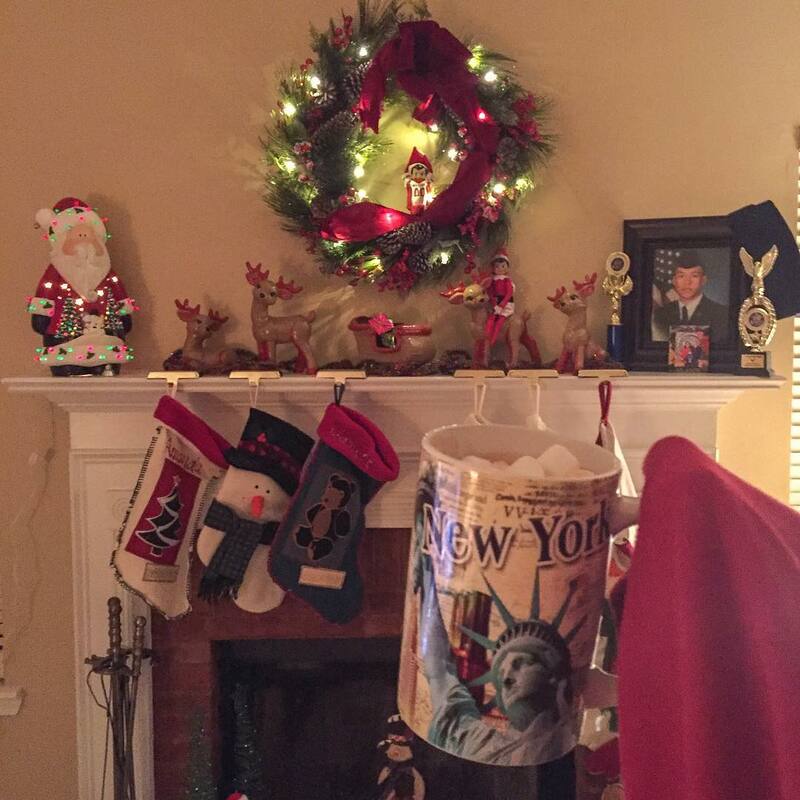 Get matching pajamas for you and your bae (I got these), make some hot chocolate, and pop in a Christmas movie! You can't go wrong with Elf or The Santa Clause! I don't care how old you are, a picture with Santa is a must every single winter! Now, it doesn't snow very much in Atlanta, but when it does, I always a make a snowman, even if it a very small one! Don't get snow at all? Get creative! We've got a bunch of ice skating rinks here, so this is just a must! I haven't done this yet because I am scared that I'm going to like break my leg or something. Got any tips? This was one of my favorite things to do in high school! Host a fun little bonfire and get cozy. Don't you just love a good gingerbread house? I've never actually eaten the house. I just decorate it!. What about you? 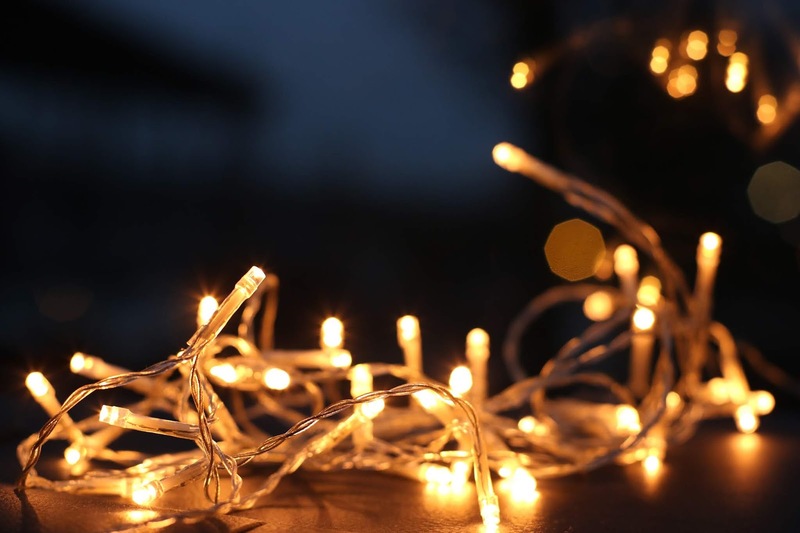 Your winter playlist can be some of your favorite Christmas songs or even just your favorite songs of the moment. Spotify is the best for this! During this season, I am reminded of just how blessed I am. Find a cause that really speaks to you and volunteer. If you don't volunteer and give back regularly, now is the best time to start. Cold weather makes a hot bubble bath so much better, am I right? While you stargaze, sip on some apple cider or hot chocolate. Christmas is very low key at my house. I mean, we don't get out of our pajamas! Hosting a holiday party allows us to dress up and celebrate the holidays with family and friends that we won't see on Christmas. We all probably have a few clothing items we no longer wear and instead of just tossing it in the trash, someone would love that coat you haven't worn in two years. How many of these have you done already? Christmas is just two weeks away! Are you excited? I actually have all my Christmas shopping done, but if you're still looking for the perfect gift, I'm sharing my last minute Christmas gift guide. This post contains affiliate links, which help keep this community up and running! Anyway, getting my Christmas shopping done so early is unheard of and honestly, I have technology to thank because most of my shopping was done online this year. I also did something I probably shouldn't have done and treated myself... multiple times. I bought myself some over-the-knee boots, sunglasses, jeans, a black denim skirt, a few sweaters, and a super cute teddy vest. Nobody let me buy myself anything for a while. 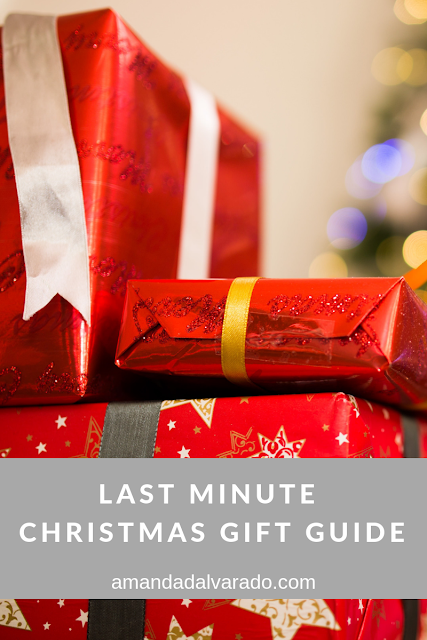 As I was saying, technology makes Christmas shopping so much easier and this is my little gift guide for everyone doing some last minute gift shopping! These are affordable and cool gifts that anyone on your Christmas list will love! Happy shopping! 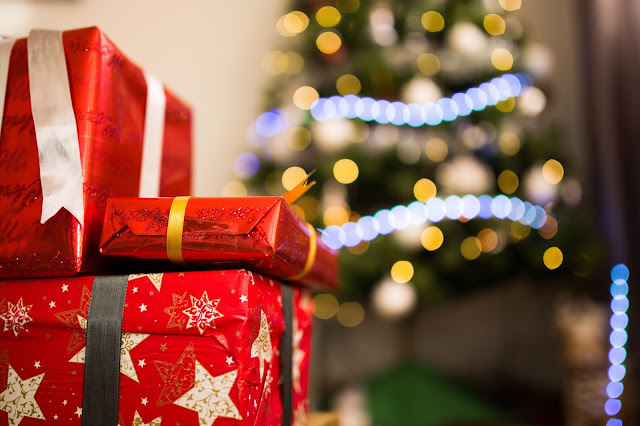 What is one thing on your Christmas list this year? Yeah, I'm a little crazy about this time of year. If you haven't, you need to check out what's on my Christmas list. Really, just send the link to your boyfriend/partner/fiance/husband because there are some cute, but totally responsible adult-ish items on there that you definitely need in your life. And... if you have yet to get on the Christmas card train, you need to do that ASAP! I love a good Christmas card and if you want me to send you one, just head over to Instagram and send me a DM so I can send one your way! I love a good Christmas movie and yes, that included all those Hallmark movies. Let me tell you, though, Netflix is killing the game with its original Christmas content. I mean... A Christmas Prince, The Christmas Chronicles, The Holiday Calendar, and The Princess Switch are good! Seriously, good. Movies are great, but when I'm busy working, driving, or just doing things around the house, it isn't really ideal to watch a movie. I want to sit and actually watch it, not just have it on for background noise. Spotify and iHeartRadio are my best friends during this time because I can listen to Christmas music anytime, anywhere! I love the classics, but I also love some the newer Christmas songs. I mean, you can't go wrong with a little Jessie James Decker (tbh I'm obsessed with her!). 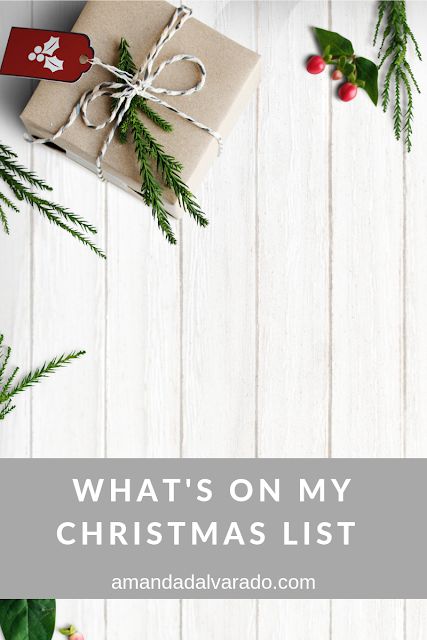 If you need a good Christmas playlist to get you going, I put this one together on Spotify with all my Christmas faves! What's your favorite song that always gets you in the holiday spirit? The holiday season is here and I am thriving. My Christmas tree is up at work, my house is decorated, I'm watching Hallmark and Netflix Christmas movies nonstop, and I've got my favorite Christmas music playlists ready to go at all times! I've always really loved this time of the year. I love cold weather, warm drinks, being bundled up in big sweaters, booties, giving gifts, and being surrounded by family and friends. I realized when making this list just how making "adult" things are in this list. I mean... books, face wash, pillows, and a french press are on this list. I guess this is adulthood. Here's what is currently on my Christmas list! I've linked (there are a few affiliate links) everything so you can ask (or buy it!) for yourself or buy it for someone you know. My pillows on my bed are TERRIBLE. Seriously, awful. This is the thing I am most excited about. No, I'm not joking. This stuff saved my skin. It was recommended to me when I got a facial a few months ago. My skin has totally changed since using this. It is totally worth the money. This is my favorite dry shampoo and it won't break the bank. A little goes a long way! Okay, I know I said I'm most excited about the pillows, but this is the runner up. Everyone I work with have some Airpods and now, I want some, too. Callie Dauler recommended this on her Instagram story a while back and I pretty much buy everything she talks about. I still have the basic band that came with my Apple Watch, but I need a new one that looks a little nicer. Girl, Wash Your Face was incredible, so of course, this is on my list. This is another holy grail skincare product. I love this! Everything Lush sells is incredible. Bath bombs, bubble bars, everything! Are we surprised this is on the list? I love coffee and this one is so, so cute! You really can't go wrong with these! I have a few and love each one. I've heard great reviews about this book, so I want to to read it myself! As someone who is a perfectionist, I think I need this book. Have you read it? Tim Ferriss is the MAN and I've also heard so many good things about this book. What are some things you're asking for this year? Anything from this list? Happy holidays! It's the best time of the year!